Chrissi's Scrappy Space: D-Lish Scraps April Challenge. So Im on a roll lately with my scrapbooking, and challenge entries. I'm really loving the inspiration and how my pages are turning out. 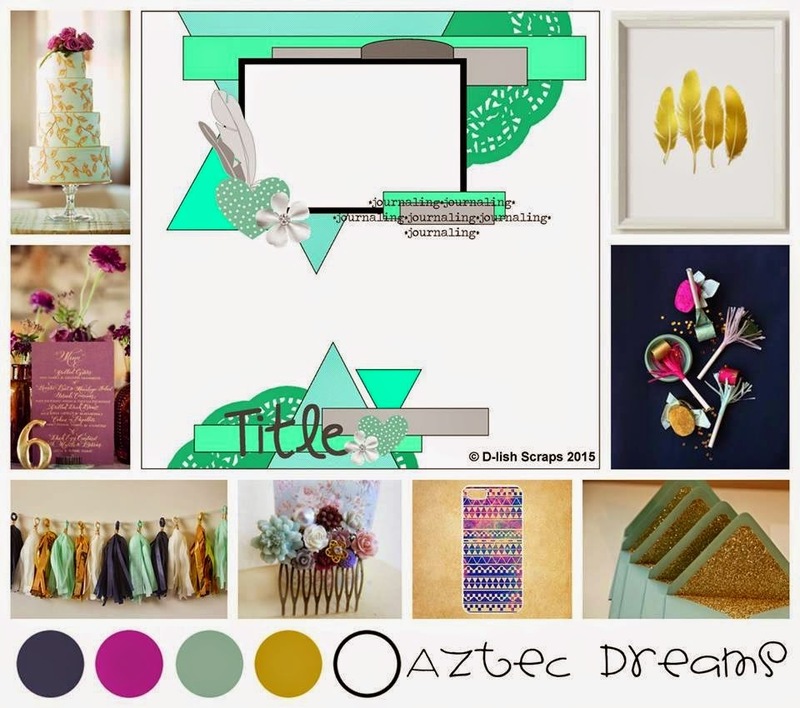 This was a mood board challenge, I just loved the gold feathers and that raspberry colour. I'm a Stampin' Up demo, and I interpreted that as rich razzleberry, so that is what I used. When I saw this mood board I knew I wanted to use a recent pic I had of myself. This board was very feminine to me, and having 2 boys, well 3 if you include the hubby, I don't often scrap in these colours, and I thought it was time I added a pic of myself to my album this year. I wanted to use my feather dies and cut some out of gold glitter paper. I saw that much, the rest of the layout came together as I went. The backround is my favourite. I misted a Kaiser stencil I have, but I focused the mist on the centre so the colour got lighter as it sprayed out. I like that it gives it a look of matting the photo. I love the gold, but I also wanted to add a touch of the razzelberry. So I added splatters first, then decided to colour the wood veneer butterflies as well. It gives it just enough colour. Such a gorgeous page Chrissi. Love all the gold. Thanks for playing along at D-Lish Scraps this month. I love how feminine and pretty your layout is. The misting worked well. Thanks for joining us at D-lish Scraps.